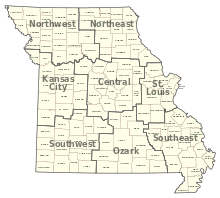 The Missouri Department of Conservation (MDC) and the Missouri Conservation Commission were created by Article IV Sections 40-42 of the Missouri Constitution, which were adopted by the voters of the state in 1936 as Amendment 4 to the constitution. The Commission is vested with control, management, restoration, conservation, and regulation of fish, forest, and wildlife resources of the state. The Department of Conservation owns and oversees hatcheries, sanctuaries, refuges, and reservations, and enforces the state wildlife code. The Commission consists of four individuals appointed by the Governor of Missouri to serve unpaid 6-year terms. No more than two of the individuals may be from the same political party. As of 2016[needs update], the ninth and current director of the Department of Conservation is Sara Parker Pauley. The department publishes the Missouri Conservationist, a monthly periodical that is free to all residents of the state of Missouri. The MDC administers hundreds of parcels of land in all counties of the state. Most areas are owned by the department, but some are leased to the department, and some areas are leased by the department to other entities for management. The department only acquires land from willing sellers and compensates local taxing authorities for the loss of property taxes. The department has divided the counties of the state into eight administrative regions for the purpose of managing these lands and providing conservation services to the citizens of the state. ^ a b "Article IV: Section 40(a)". Missouri Constitution. Missouri General Assembly. Retrieved 2009-06-21. ^ "Phantom Forest Conservation Area". MDC.online. Missouri Department of Conservation. 2010. Archived from the original on 2012-06-08. Retrieved 2010-11-19. "Phantom Forest CA is leased to and maintained by the City of Des Peres Parks and Recreation." ^ a b "Conservation Action Meeting of the May 1998 Conservation Commission". MDC.online. Missouri Department of Conservation. Retrieved 2010-11-19. [permanent dead link] "...entering into a lease agreement with Empire District Electric Company to develop a public fishing access-named Cooper Creek Access-on 29.43 acres on Lake Taneycomo in Taney County." ^ "Regions". MDC Online. Missouri Department of Conservation. Retrieved 2010-07-30. Publications by or about Missouri Department of Conservation at Internet Archive.